Over the last month we've reported on the Scottish government's unthinking commitment to sectarian education, including their 450% increase in funding for a Catholic teaching programme and praise for a conference where the archbishop of Glasgow told state school teachers to "prioritise the Catholic mission of your school over other considerations". But what does look like in practice? 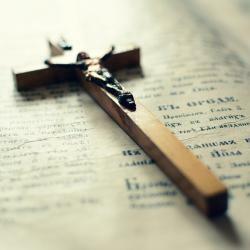 This week I ask how do you get to teach in a Catholic school, and look at how religious dogma and privilege throw up barriers at every stage of the process. 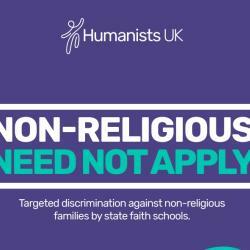 Also this week research from Humanists UK shows the scale of faith schools specifically discriminating against the nonreligious in admissions. The problem goes beyond just favouring families of the 'right' religion, to a hierarchy with certain religions on the top and the nonreligious majority at the bottom. For many people admissions are the most visible way faith schools undermined freedom of religion or belief, they are not the only one. Time and again the polling shows that the British public don't support discriminatory faith school admissions. Ending this ugly practice should be the first step to more inclusive education system for all. Together we can achieve this. This week can you do one thing to help support the campaign? Can you share your story? The harm and discrimination of faith schools shouldn't be normalised, minimalised or ignored. Sharing your story makes it harder for the faith school lobby to do this. If you'd like to find out or do more, please visit our get involved page. Alastair Lichten explains how the Catholic Church dominates recruitment in 'its' schools in Scotland. Four in ten state faith secondary schools in England discriminate against children from non-religious families, including 60% of Catholic schools, according to a report published today.